The Life Manifesto is a thought provoking manifesto created to inspire people from all different backgrounds and cultures to re-evaluate their lifes in a more positive and clearer way. 'Life Manifesto' has been viewed by millions all over the world. 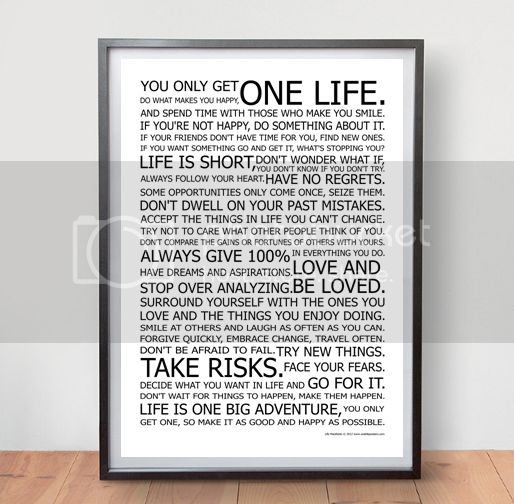 This thought provoking poster helps each individual differently, inspiring and motivating them to change their outlook on life for the better. Read the Life Manifesto each morning and let it inspire and motivate you, however big or small the alterations you make! Life is 10% what happens to you and 90% how you react to it. In 100 years no one will remember who you where or what you did, so don't worry about others perceptions or opinions of you. life is what you make it! Its too short to be anything but happy! Its the things in life you don't do that you live you regret. . . go start your journey to positive thinking and get your copy of the Life Manifesto today. Why not let us know on our Facebook wall or tweet about us to your lovely chums using #lifemanifesto. Place it on your dorm room wall, kitchen or maybe in your office to motivate your staff. Take a photo and add it to our Facebook wall! to show us where yours is hanging! Its now available in two sizes. A1 which is ideal for dorm room walls, or A2 which is smaller and ideal for framing.The A2 sized poster is printed on 100% recycled paper too, so you can have a clear conscience!